Hardy rhizomatous perennial, hairy, ovate-lanceolate leaves. Bears orange-pink daisy-like flowers with a central spiky cone that becomes more pointed as the plant matures. Full sun and drought tolerant. Plant dies down in winter. Can plant in a container. Cover with compost in spring and soak well. Sprinkle petals in salads and put in summer drinks. Roots, rhizomes and aboveground parts. Natural antibiotic, boost immune system. Anti-fungal, anti-viral, anti-allergenic, anti-inflammatory and detoxifying. Treat Aids and other diseases affecting the auto-immune system. Boils, septicaemia, cancer, syphilis, eczema, ear infections, infections of the respiratory and urinary tract, cold sores, blisters (Herpes simplex virus). Decoction - treat minor wounds, burns, boils, ulcers, skin inflammations and as a gargle for throat infections. 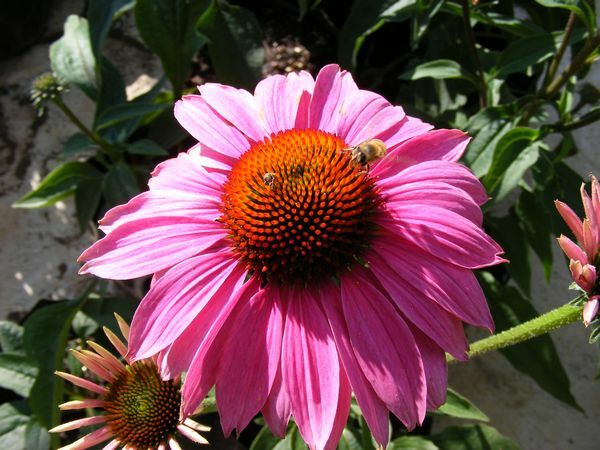 Dilute echinacea vinegar as a gargle and mouthwash for sore gums. Add a dash of echinacea vinegar to the rinsing water after washing the face, to treat acne, oily skin, rashes and spots. Combine with comfrey to prepare a good foliar feed.